Pick a topic from social studies, science, or any curriculum theme. With practical suggestions, sentence starters, and guiding questions, the student workbook helps young learners to formulate an inquiry question, research, and create a unique slide show. Valuable public speaking tips, speaker notes, and rehearsal advice jazz up a routine report into a dynamic and appealing presentation. • MICROSOFT USERS: Select the version (2016/2013) that matches software on your device. • GOOGLE USERS: Each student needs a Google Drive account. Suitable for Chromebooks and Google Classroom. • OFFICE ONLINE USERS: Each student needs a OneDrive account and Internet access. Use TechnoPresenter with unlimited users at your site. A site is a physical location such as classroom, school, learning center, or home. If you teach at multiple sites, you will need to purchase one curriculum unit for each location. Print as many curriculum guides and workbooks as you need to deliver instruction. Transfer the files to all devices at your site. Files cannot be posted in public domain. FOSTER CONFIDENT PUBLIC SPEAKERS: Make classroom presentations more effective, engaging, and original. Using Google Slides or PowerPoint, TechnoPresenter lesson plans teach essential research strategies and public speaking techniques. Provide a foundation for key life and 21st century professional skills. 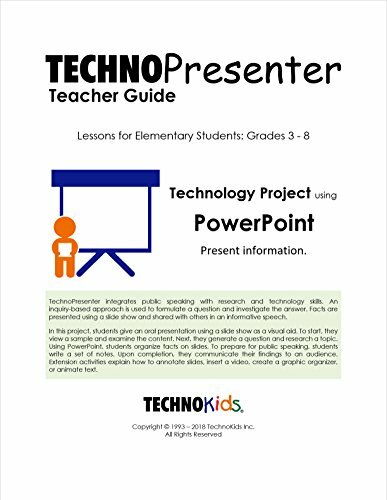 PUBLIC SPEAKING LESSONS: TechnoPresenter includes a teacher guide for curriculum planning, PDF student workbook to promote independent learning, and all necessary resources, including customizable assessment tools (student and peer checklists, teacher marking rubric, skill summary), example slide shows, parent letter, certificate, and program tool flashcards. FLEXIBLE READY-TO-USE PROGRAM: Designed specifically for elementary and middle school students, the slide show and oral presentation can be integrated into any subject area. OPEN-ENDED CURRICULUM MODEL: Teacher tips include suggestions for implementation, for example, offer a tribute to a significant figure, raise public awareness about a crucial issue, commemorate a celebration, and more! If you have any questions about this product by TechnoKids, contact us by completing and submitting the form below. If you are looking for a specif part number, please include it with your message.